The Bald Hill site. Image: Australian Bauxite. The Sydney-based company announced last month that a 30,000-tonne sale of cement-grade bauxite had been secured for shipping in March. It has worked with the customer for the past four months to achieve optimum product specifications. 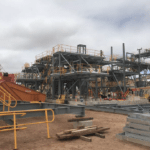 Australian Bauxite marketing manager Paul Glover, commenting last month, said the company’s bauxite was blended specifically to suit the cement-grade bauxite customer, which was what it did for each sale. “It is very clean bauxite due to efficient processing at the mine and careful transport pit-to-port,” Glover said. 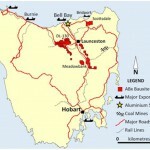 Australian Bauxite is in the middle of awarding a series of contracts for the Bald Hill operation. The company has already awarded a contract for mining, processing and blending at the mine to Hazell Bros. It has also commenced contract negotiations for transporting its product to the Bell Bay port. At Bell Bay, Australian Bauxite has contracted Qube Logistics for the stevedoring services and stockpiling arrangements, in conjunction with TasPorts. Monson Shipping, meanwhile, has provided shipping agents services and Briar Maritime has provided independent ship surveys. Australian Bauxite expects sales of fertiliser-grade bauxite to continue throughout the year as the product achieves wider market approval.